“So what do you do?” It’s such an innocent and often-asked question. It’s a natural ice-breaker – you hear it whenever you meet a new person, whether at a networking event, a business gathering or a social encounter of almost any kind. To an unemployed job-seeker, however, it’s a loaded question that can sometimes cause squirming and discomfort. Exactly what do you say? Do you simply announce your job category or title (e.g. “I’m a Sales Manager,” “I’m a Computer Engineer,” “I’m an Accountant,” etc.) and hope they don’t embarrass you by asking where you are currently working? Or, do you take the initiative and immediately go on to explain that you are not actually working right now … and in fact you are looking for a job? If you subscribe to the notion that Networking is considered by most job-seekers to be the most likely activity to produce success in today’s ultra-challenging, highly competitive job market … then you really should be prepared to talk about your job-seeking status to just about everyone you encounter. [Read “Looking for Networking in All the Wrong Places” for an overview of the wrong vs. the right ways to network.] The question is, what term do you use? Saying “I’m in transition” has become one of the most widely accepted euphemisms in use today for being out of work. Like most euphemisms, it’s a term that is meant to make an unpleasant thing sound more palatable. “Why did you leave your last job?” Answering that often uncomfortable question is another situation where euphemisms are frequently used. That question comes up during almost every interview, and on most job applications. 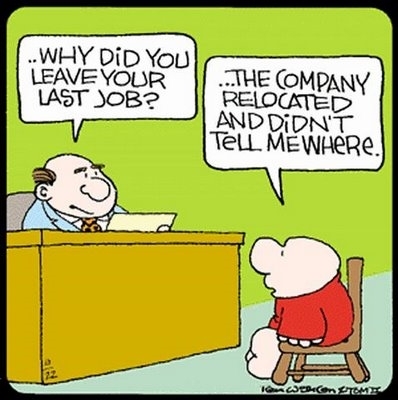 Explaining why you left your last job – or for that matter, pretty much every job listed on your résumé – is something that certainly requires some thought. The answer you give must be both truthful and somehow palatable. It should ideally be easily understood and logical, and yet at the same time not cast you in a negative light to your potential future employer. Of course, if it was your decision to leave a company and move on to another job elsewhere – it’s usually pretty easy to say something like: “I left for a better opportunity.” The problem arises when leaving was not your idea. If you were let go “for cause” (meaning your actions caused you to be fired) it’s the most difficult scenario to explain going forward. You need to tread carefully. On the other hand, if you lost a job due to circumstances beyond your control (e.g. company-wide layoffs, poor economic conditions, etc.) then using the right euphemism can often satisfy an interviewer’s questions and explain gaps between jobs. With both of these lists, feel free to combine the words or phrases in different ways to create new variations. And if you’ve heard any other euphemisms for either being out of work, or for leaving a job that aren’t already included on either of these lists … feel free to add your new terms in the comments section below! Very good euphemisms Michael. I’ve often thought about these questions and how to address them. You can be sure that I will use them, combined or separately. Michael – I love the way you write and you’re thoughts hit many of the points and issues faced in today’s changing employment model dead center but I think you missed an opportunity to write about how to effectively deal with that “What do you do” question that comes up again and again. What are your thoughts on an elevator speech (or something similar) that answers the question in a way that the person asking it actually hears something and does not mentally go into a ho hum zone? BTW – I think too many people slam a label on their back and say something like consultant or freelancer because they don’t have an effective way to answer the question. Freelance is respected career path and an area of growth both in the US and elsewhere – I know many professionals who would not work any other way and earn way into the 6 figures. So – my question to you is 1) what do you think of an elevator speech and 2) how would you construct one, or something similar, so you do not fall into that black hole of labels and candidate speak? Michael – another euphemism for being unemployed that I have heard is “Voted off the island”. Probably belongs towards the bottom of your list. Good one! I added it to the list. You may wish to re-evaluate this list. It’s two years later from your original post and the words/phrases “consultant” and “self-employed” all but scream “I’m unemployed.” You should do an update and evaluate how many of these euphemisms have fast become eye-rolling cliches. Impressive blog. Very practical and without unnecessay buzz words. I just shared few articles of your blog on my FB. I love your Euphemisms for Being Out of Work/ Why You Left a Job. Thanks for all of your information, and also for using your valuable time to help all of us ! !